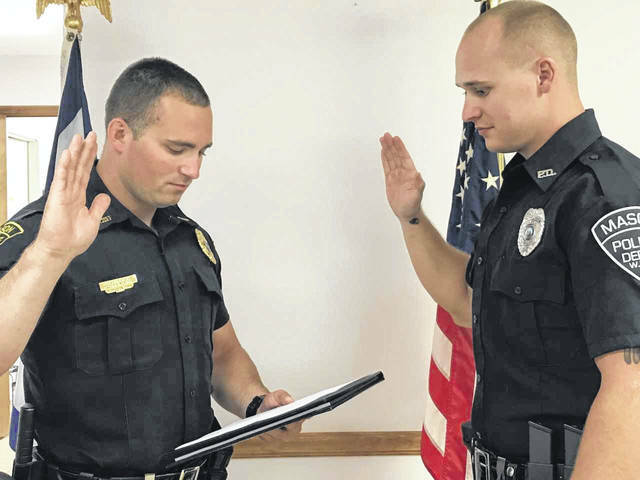 Mason Police Chief Colton McKinney, left, is pictured as he administers the oath of office to new Officer Tyler Doss of Point Pleasant. Doss began his duties as Mason’s third full-time officer on Monday. MASON — The Mason Police Department has gained another full-time officer with the recent hiring of Tyler Doss. Doss, of Point Pleasant, was administered the oath of office Monday by Chief Colton McKinney. It was also Doss’ first day of duty. The new officer joins the chief, as well as Officer Clayton Gibbs, as full-time policemen in the town. A fourth, Austin Toler, has already been approved by council members to join the force on Sept. 1. Mason County Sheriff’s Deputies Matt Stewart and Kendall Roush round out Mason’s police force as part-time officers. Chief McKinney said Officer Gibbs will be leaving for the West Virginia State Police Academy Basic Officer Class on Aug. 27. He stated he anticipates Officer Doss will attend the class in January.